The DVD Review and Extras Review are by Chuck Aliaga. Jack Black is one of the most unconventional movie stars currently raking in the big bucks. Sure, he's downright hilarious and charming, but he isn't exactly the kind of guy you'd necessarily expect to share top-billing in a romantic comedy. Yet, Black did play Gwyneth Paltrow's boyfriend in Shallow Hal and is Kate Winslet's prospective beau in the upcoming The Holiday, so it's apparent that the big studios have the utmost confidence in him. 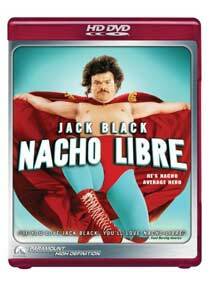 It's this amazing versatility that makes Black a star,a quality he shows off with mixed results in Nacho Libre. Ignacio (Black) is a hapless, horrible cook at the monastery in Mexico where he was raised. He is haunted by his lifelong dream to become a famous luchador, a professional wrestler like El Santo. His desire to wrestle increases when a beautiful nun enters the picture, Sister Encarnacion (Ana de la Reguera), so Ignacio attends a wrestling match and witnesses how popular the great Ramses (Cesar Gonzalez) is with the ladies. This moment is a revelation, as Ignacio changes his name to Nacho, partners up with the homeless Esqueleto (Héctor Jiménez), and enters the ring, with losing results. Nacho and Esqueleto continue to be paid to lose their matches, as people flock to watch them fail miserably night in and night out. However, when the monastery learns of Ignacio/Nacho's new hobby, they kick him out, leaving this troubled soul to choose between God and being a luchador. Lo and behold, watching Nacho Libre on DVD did prove to be a much more rewarding experience than I had in the theater. With my expectations now out the door, I was able to sit back and enjoy the sight gags and Black's hilarious accent. The lack of plot substance didn't matter this time, in what amounts to 90 minutes of Black being Black. Good luck staying in your chair during the wrestling scenes, and marvel at his facial expressions when he's performing such a menial task as driving his motorcycle/cart contraption. The quirkiness of the story (co-written by Mike White of Chuck and Buck fame) was more effective the second time around, and the Esqueleto character much more appealing. At home, it was also easier to appreciate the wonderful score by Danny Elfman, with some help from Beck and from Black himself. Black is going back to his roots for the upcoming Tenacious D in the Pick of Destiny, teaming with old friend Kyle Gass to bring his two-man rock band to the silver screen. This project promises to be quite a bit less restrained than Nacho Libre, but, after giving it a second chance, I'm fully confident that this good-natured picture will always stand out among his filmography. If not, at least his amazing "stretchy pants" will never be forgotten. Image Transfer Review: As one might expect for a brand new film, the HD transfer is quite attractive. The subtle shadings of the skin tones are particularly notable here. Black levels are quite bold throughout. Detail is very crisp for the most part, with excellent textures visible on the friars' robes, in contrast to the satiny smoothness of the wrestlers' masks and the "stretchy pants." Edge enhancement is seldom visible, thankfully, and little artifacting or posterization is present. The sequences of Ignacio in the wilderness of the Mexican desert are quite beautiful in their starkness, and the blue of the sky is often breathtaking. There are no serious problems with the transfer, but the focus is soft enough that it doesn't leap off the screen. Audio Transfer Review: The 5.1 DD+ audio tracks have an amazingly wide front soundstage that provides an incredible presence for the music; it often feels like having a mariachi band in your living room. Directionality is clear without drawing attention to itself. The wrestling sequences offer plenty of oomph and racket, and the surrounds pump out the crowd noise to put you into the arena. A very satisfactory soundtrack, surprising in its quality for a low-budget comedy. Extras Review: The extras are mostly identical with the standard DVD release, with the exception of the omission of the unrelated trailers, and the inclusion of two additional featurettes. None of the extras are in HD other than the theatrical trailer. This large, hilarious extras collection is a nice surprise, beginning with Dinner and a Commentary with Black, Hess, and White. The result is very funny, with Black at his manic best, but I could have done without the excessive lag time between comments. There are a total of seven making-of pieces in all, beginning with the longest, and most informative, Detrás de la Cámara. This 28-minute segment is an intimate look at the making of the film, via hand-held cameras and cast interviews. Black is very funny here, given free rein to go crazy. Jack Black Unmasked! runs for 12 minutes and is more on-set footage. This is more of a standard EPK piece, but it is still very funny. Two lengthy featurettes that did not appear on the standard collector's editon DVD are Exterior-Hacienda-Night and Interior-Lucha Libre Ring-Night, which are documentary-style footage covering the shooting of two scenes. If you couldn't get enough behind-the-scenes of Nacho Libre, then your prayers have been answered with nearly half an hour more of Jack Black ad-libbing. Lucha Libre is a three-minute look at Mexican wrestling, Hecho en Mexico is a two-minute piece about the locations for Nacho Libre, and Moviefone Unscripted with Jack Black and Héctor Jiménez is a nine-minute sit-down with the film's two main actors. Jack Sings is a pair of clips showing him singing the songs La Canción de Ramses and La Canción de Encarnación. Three deleted scenes run for over nine minutes, and include an extended sequence with Peter Stormare. We also get three TV promo spots and a photo gallery. Despite its disappointing showing at theaters, Nacho Libre is the kind of film, like Anchorman and Old School, that is made for DVD. It is a comedy full of catchy lines and sequences that are sure to be quoted and (gasp!) reenacted for years to come. Having Jack Black as the headliner only increases the film's potential cult status, and Paramount's fine HD DVD doesn't exactly hurt either.